Living Colors Originally uploaded by saudi jeans. I had lunch on Saturday at Living Colors of Faisaliah Mall. Like Fahad, I had the Chicken Panini with Balsamic and it was good; not great, but good. Better than the food was the design and the colors of the place and packaging. 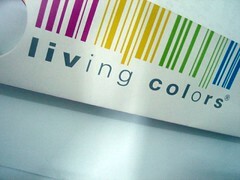 Living Colors have another branch on Tahlia St. (aka Prince Mohammed bin Abdul-Aziz St.). مش متأكدة، بس سمعت أن أصحاب المطعم شباب من جدة..
هذا شيء يشعرني بالفخر، أنه شباب سعوديين قدروا يصنعون شيء مميز وملفت .. I just wish their food was as good as their packaging! It’s great having/ordering it and at home; loved their chicken balls. Hi…, I was reading your post about the Al Faisaliah Mall ! Been there many times and your comments brought back some pleasant, if somewhat anxious memories. Before the Globe was turned into a restaurant, I had been shown around it ! Sumptuous !! But that’s not why I’m writing ! I’ve put pen-to-paper to ask a question ! I’m British, live in Belgium and I always listen to the BBC…, especially the program “From our own correspondent.” http://news.bbc.co.uk/1/hi/programmes/from_our_own_correspondent/ About two or three programs ago, one of the reporters mentioned that he talked with a young blogger going by the name of “Saudi-Jeans.” (hope I didn’t misunderstand) This person helped him comprehend the workings of state control and more particularly, the unemployed youth. Can I ask you if you were that person ? If it was you, I’d like to mention that I’ve become a “blogger” especially to get in contact with you. Although I’m slowly getting to understand that it was perhaps not really necessary. Anyway, my first blog will allow you to understand the reason for my contacting you. http://danians.blogspot.com/ If you wish, you can contact me at danians@scarlet.be , but please use your “Saudi-Jeans” as your subject, otherwise, it might be confused with spam. By the end of this week, we will have a new website…, http://www.danians.com , this is completely provisional and under construction until it’s updated to Flash next year. There, you will see the Al Faisaliah !! All this, simply to ask you a few questions about the Saudi youth unemployment problem…, but I will put my questions on hold until I hear from you !